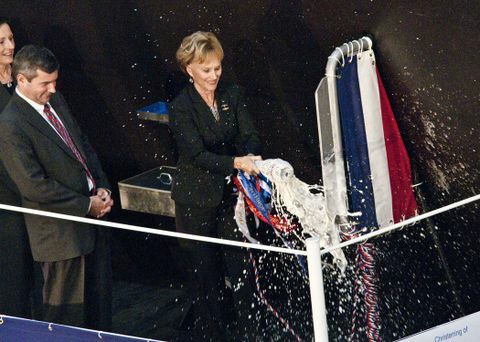 NEWPORT NEWS, Va., Nov. 6, 2010 -- Northrop Grumman Corporation (NYSE:NOC) christened the eighth submarine of the Virginia class, California (SSN 781), at the company's Shipbuilding sector in Newport News, Va. 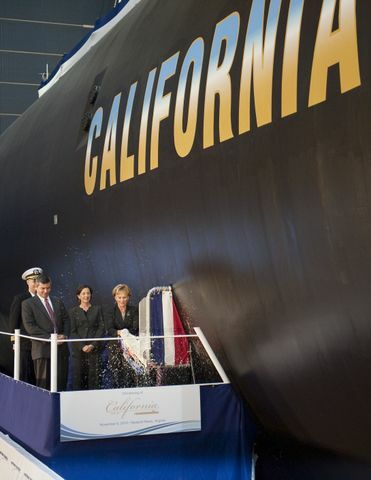 Guests included Northrop Grumman Shipbuilding and General Dynamics Electric Boat employees who are building California , and their families; family and friends of the California crew; U.S. Navy personnel; and government officials. In conjunction with California 's christening, Team Submarine launched an interactive learning event to promote science, technology, engineering and mathematics (STEM) at the Naval Surface Warfare Center in Corona, Calif. During the month-long event students, teachers and parents watched the christening, will learn about submarines through exhibits and participate in an interactive submarine simulation called Mission Ocean. These STEM events are being held at the Naval Surface Warfare Center in Corona today, at the Admiral Kidd Conference Center in San Diego on Nov. 15 and at the California Science Center in Los Angeles on Nov. 18. California , the eighth ship of the Virginia class, is named after the "Golden State." The ship's motto is, "Silence is Golden." Upon delivery to the Navy in 2011, it will be the most modern and sophisticated attack submarine in the world, providing undersea supremacy well into the 21st century. Northrop Grumman Shipbuilding is teamed with General Dynamics Electric Boat to build Virginia -class submarines.